I love dogs of all stripes, colors and persuasions. Tell me off, and if you’re a human, I’ll be right back at ya. Tell me off, and if you’re a dog, I’ll beg for more. Whenever I see a dog anywhere, I’m drawn involuntarily as if beckoned while in a trance, powerless to resist. Just to be able to look at them, pet them, hang out with them is a privilege and calms me immediately. So, imagine my surprise a few weeks ago when I was part of the craziness that is Los Angeles International Airport. I was waiting to board an airplane for a flight to visit my family. I had already navigated parking, walking to the terminal, checking in, and making my way to the gate. I found a place to sit in a crowded area and with great difficulty was trying to relax and read. I glanced up for a moment and saw a big, curly dog walking toward me followed by a few humans. Naturally, I sprung out of my seat to investigate. I was greeted by Sofie, a Golden Doodle (Golden Retriever and Poodle mix) resplendent in a red cape, who was next to her owner. I was all over Sofie–calm, patient Sofie. Other passengers sidled up to make her acquaintance. Sofie nonchalantly tolerated her admirers— just another day’s work. Heidi Huebner, who was part of Sofie’s entourage, explained that the PUP (Pets Unstressing Passengers) Program at LAX has been operating since April, 2013. For years, dogs have been used elsewhere in such duty providing stress relief and comfort to people at hospitals, homes for seniors, schools, and other similar facilities (I used to be a pet therapy team with my dog at a local hospital.) Now, dogs are doing it at airports, those high stress generators. 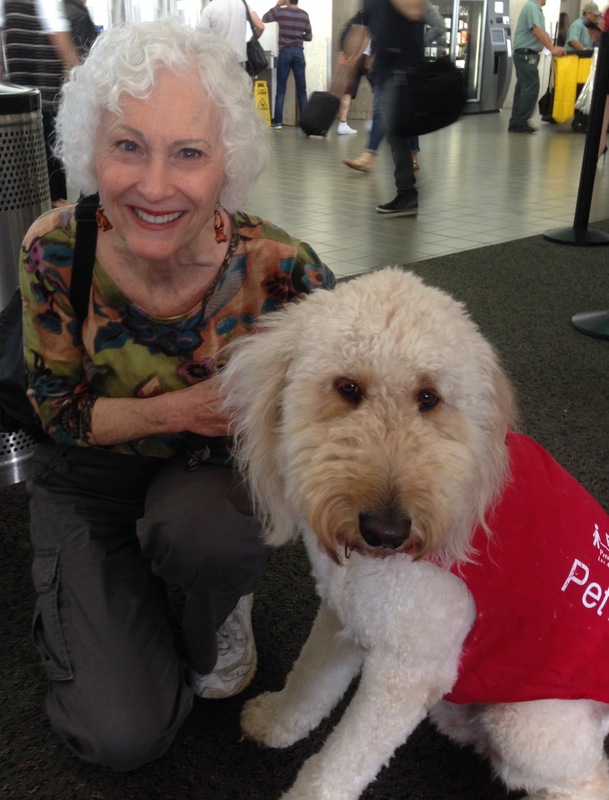 The dog/owner volunteer teams are trained and then registered with Therapy Dogs, Inc. Heidi added that similar programs are now at 26 airports throughout the nation. To volunteer at the PUP Program and other VIP (Volunteer Information Professionals) Programs at Los Angeles International Airport, visit their website at: www.lawa.org/vip. Now, I’m just wondering where the human Sofies are trained and registered? I need a few of those in my life. CHITCHAT: A few weeks ago I gave a talk in front of 100 people at the Osher Lifelong Learning Institute’s “Lori and Don Brault Lecture” at California State University Long Beach. It was very well received, and I had a great time. 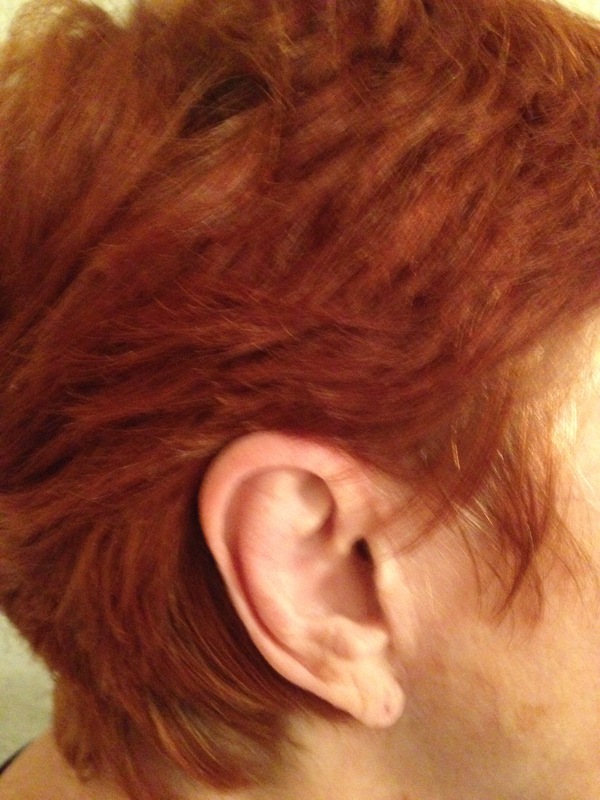 I love to help and inspire people to reinvent themselves in their later years. It’s definitely possible, and people just need to be encouraged and informed how to do so. Last week I was sitting at my computer, busy, busy, busy. I went to grab for my pencil, missed, and knocked it off the computer desk. Oh, I don’t need this now! I muttered to myself. I bent over and groped for it on the floor. No luck. After a few choice expletives, I turned on the flashlight on my cell phone (a nice feature BTW) and bent over even further, shining the light around. I finally spotted the blasted pencil. 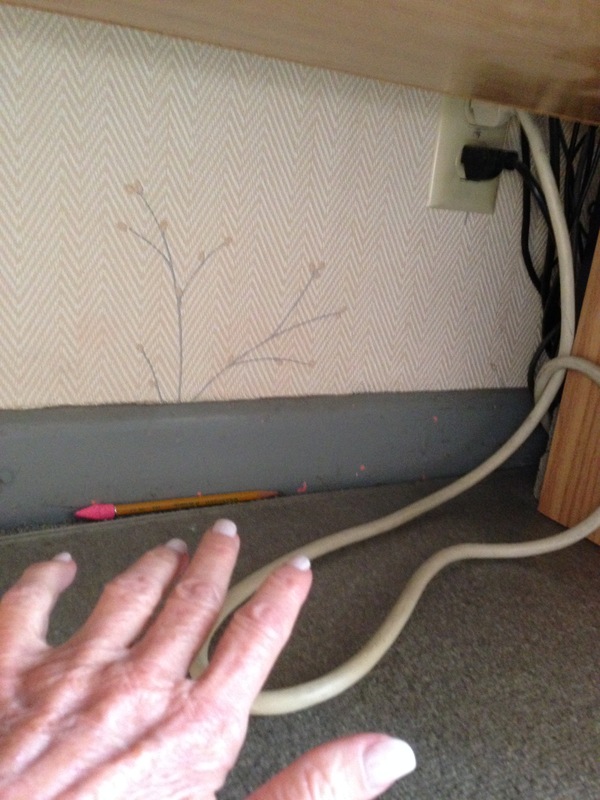 Of course, it had rolled completely under my desk to the far end, tightly jammed up against the wall molding behind the computer cord, like a kitten hiding under the bed. I had to bend over to the point where my head was at the same level as my feet and reach to my arm’s length to grab it. As I was doing so, I realized how good it felt to stretch my spine. My errant pencil had offered me a little free exercise. Why can’t we extrapolate those kinds of experiences to larger ones in our lives? How many times are we inconvenienced by unforeseen circumstances which annoy, irritate, or anger us? We’re less able to tolerate them when we’re on a deadline, tired, running late to an appointment, etc. That’s when each of our own versions of “expletives deleted” kicks in. Some opt for the “F” word, the “S” word, the “D” word, the “H” word, or whatever. Others downplay it such as what a childhood friend’s father used to say: “Oh, feathers and moose meat!” I always liked that. I wish I had found out the origin, but I was just a kid and not so fascinated by words and phrases as I am now. Anyway, that was just as powerful for him as the current popularity of the “alphabet” words. There’s that old expression, “When life hands you a lemon, make lemonade.” Well, that’s not just for the big, oppressive stuff of life. It can also be for the little things, too. When something interferes with your plans for a minute, an hour, a day, see if you can turn it into an advantage or opportunity. Don’t let the small irritants you encounter take a few more seconds off your life span. Those seconds are valuable and finite. Save them for the rewarding things. If you must, throw that pencil on the floor deliberately to open new possibilities. NEWS: The interview I announced on my last blog has been temporarily postponed. I’ll post it again when it’s rescheduled. I’m definitely a problem solver–the “fix-it” type. Are you that type? Do you find that when you’re just trying to help someone with your sage advice, worldly wisdom, or unsolicited opinion, they become defensive and suddenly dump all their anger on you? Maybe they don’t want your advice, wisdom, or opinion. Maybe they just need to rant. Occasionally, we all need a sounding board. There isn’t necessarily a solution to what we’re upset about. We just want to verbalize it. Somehow, doing so to the wall or a chair just doesn’t cut it. Why an inert human being hearing our angry commentary seems so comforting is a mystery. Maybe it just makes us feel valid that another sentient being, preferably a human one, cares enough to spend time with us and just listen. Now, when my son discusses something that is bothering him and I slip into fix-it mode, I try hard to remember to ask, “do you want my input, or do you just want me to be a good listener?” I don’t always catch myself and am still a work-in-progress, but when I do, it has avoided so many arguments, misunderstandings, and hurt feelings. I show that I’m being supportive, that I respect him for being able to handle it himself, and that I’m not being intrusive. Try it, even if you have to put a piece of tape over your mouth while you’re doing so. It may save a lot of friction in your relationships.